In an effort to meet curriculum expectations, encourage curiosity and questions, and include everyone I want to incorporate inquiry circles into the classroom. Inquiry circles help students learn about the world and provide them with some choice in the matter. To encourage students to become thoughtful readers, thinkers, communicators, and researchers, I am teaching specific lessons in comprehension, collaboration, and inquiry. 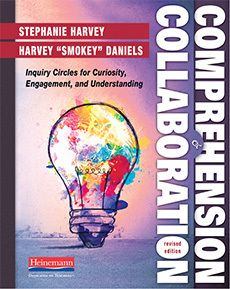 The lessons were from Comprehension and Collaboration: Inquiry Circles for Curiosity, Engagement, and Understanding by Stephanie Harvey and Harvey "Smokey" Daniels. Harvey and Daniels emphasize that the lessons should be taught repeatedly at every grade level and different subject areas. Students practice the collaboration lesson, Turn and Talk.